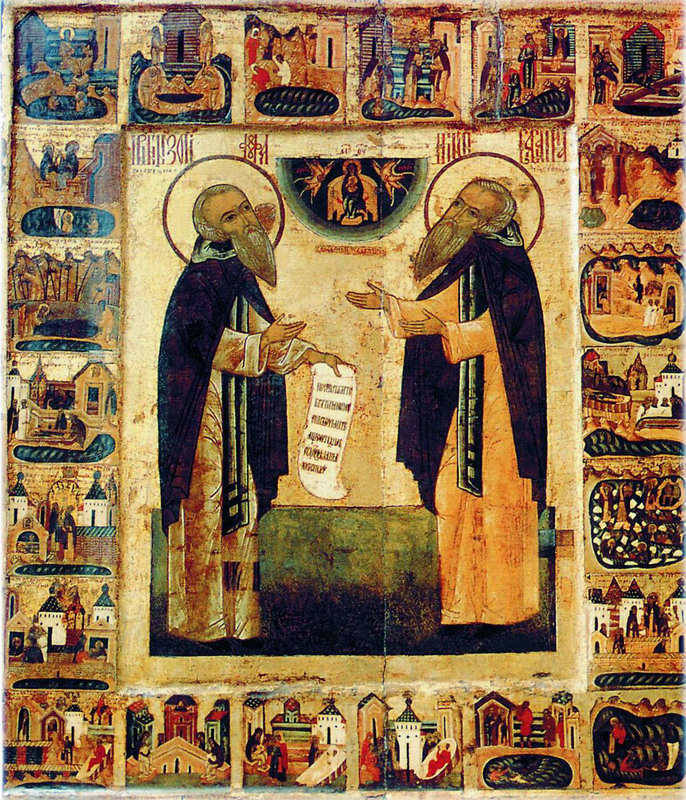 Two of the Russian Orthodox Church’s most important monastery founders are commemorated on August 8, Saints Zosimas and Sabbatius of Solovki. 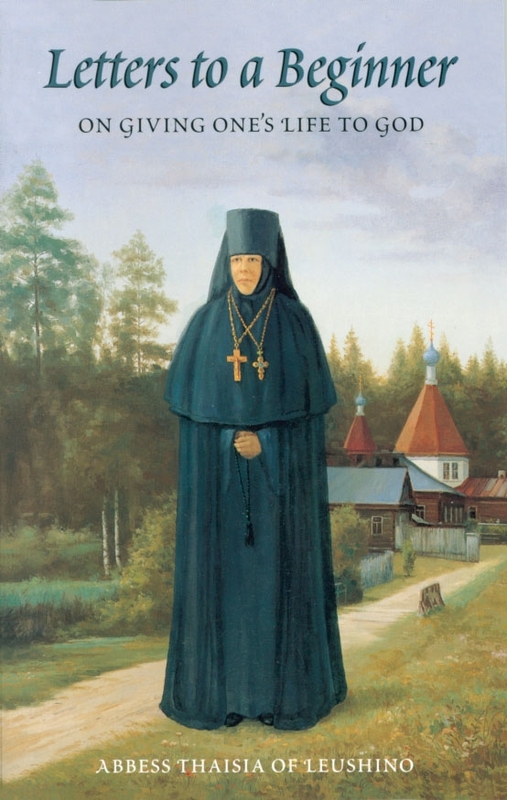 Though not my patron saint (Abba Zosimas of Palestine, whom the Lord led to find St Mary of Egypt and bring her edifying life story to the Church), I have a special devotion to St Zosimas of Solovki; both share a brave yearning to seek God through the monastic way in the wilderness. Saint Zosimas is also commemorated on April 17, and is reproduced below; the Life of Saint Sabbatius may be found on September 27. 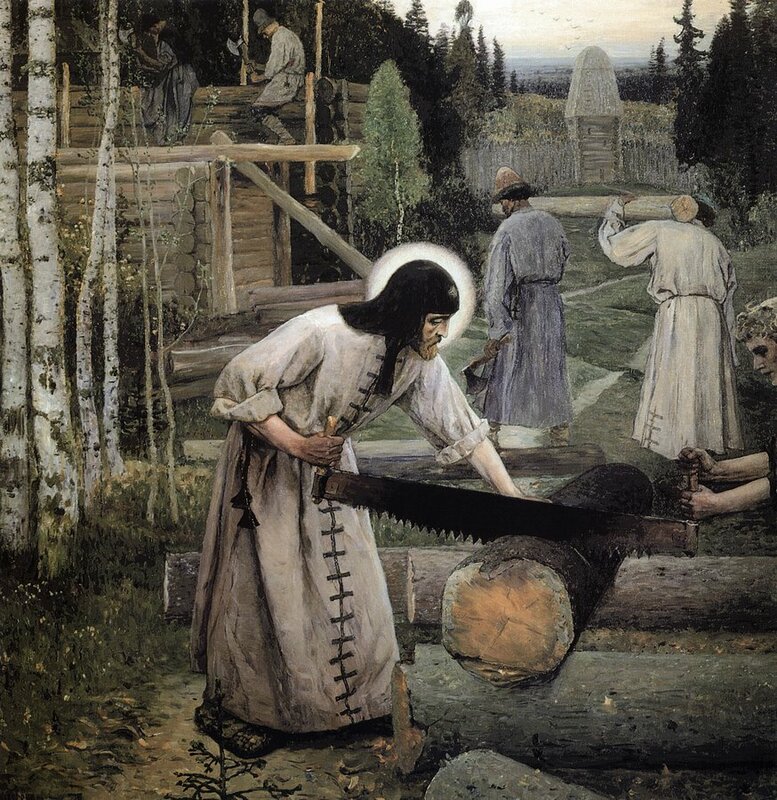 You can read about them also in the classic book on the monastic movement in the Russian north, The Northern Thebaid (St Herman of Alaska Press, Platina CA). 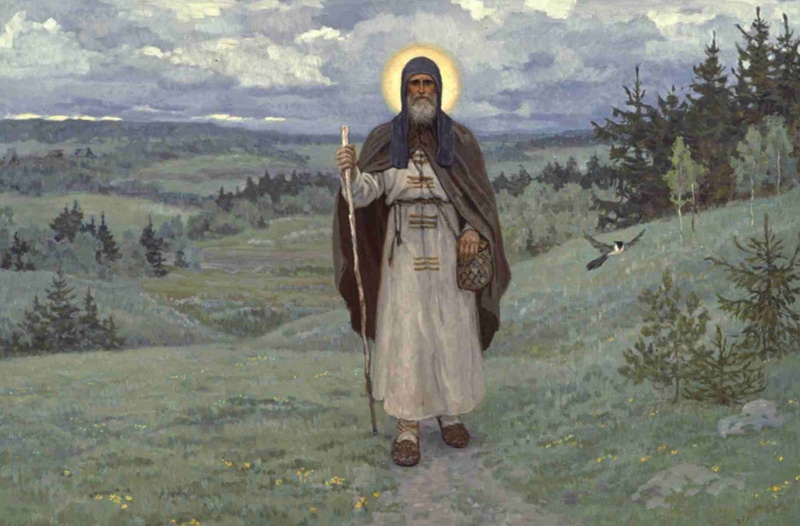 (April 17, OCA) — Saint Zosimas, Igumen of Solovki a great luminary of the Russian North, was the founder of cenobitic monasticism on Solovki Island. He was born in Novgorod diocese, in the village of Tolvui near Lake Onega. From his early years he was raised in piety, and after the death of his parents Gabriel and Barbara, he gave away his possessions and received monastic tonsure. 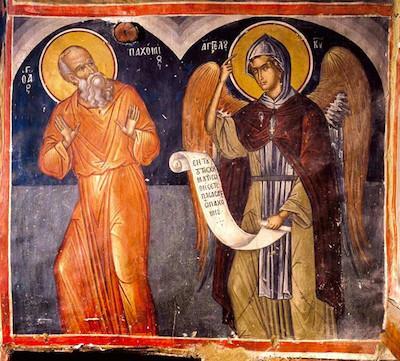 In search of a solitary place, he journeyed to the shores of the White Sea, and at the mouth of the Suma he met Saint Herman (July 30), who told him of a desolate sea island, where he had spent six years with Saint Sabbatius (September 27). Around the year 1436, the hermits crossed the sea and landed at the Solovki islands. 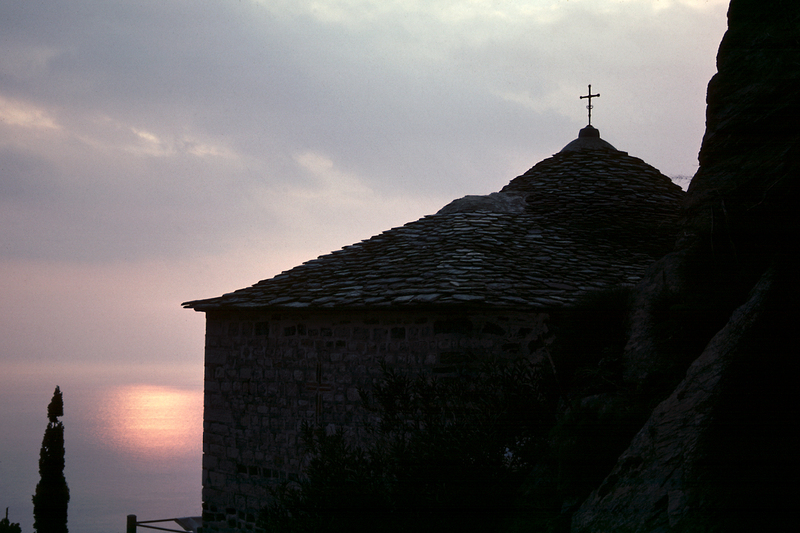 There Saint Zosimas had a vision of a beautiful church in the sky. With their own hands the monks built cells and an enclosure, and they began to cultivate and sow the land. Part 1 of a three-part series from the journal, Orthodox America. “If thou wilt be perfect, go and sell that thou hadst, and give to the poor, and come, follow Me” (Matt. 19:21). From the beginning these words of Christ have been a clear call to all Christian monks that they have felt impelled to obey to the letter. The advice of Jesus to the young man who sought a greater perfection, beyond that of following the ten commandments, was to sell all he had and to follow Him (Matt. 19:21). Another man He challenged to follow Him without delay, without even taking time to attend to his father’s funeral (Luke 9:60). These are hard sayings for people in the world, but admirably suited to monks and nuns. The ideal of a life entirely given over to God can be found on many pages of the New Testament. St. Paul held virginity in high esteem and advocated it for those who could bear it (I Cor. 7: 1, 7, 37, 40). We find many examples in Holy Scripture of men and women giving their lives unreservedly to God and to the service of the Church. 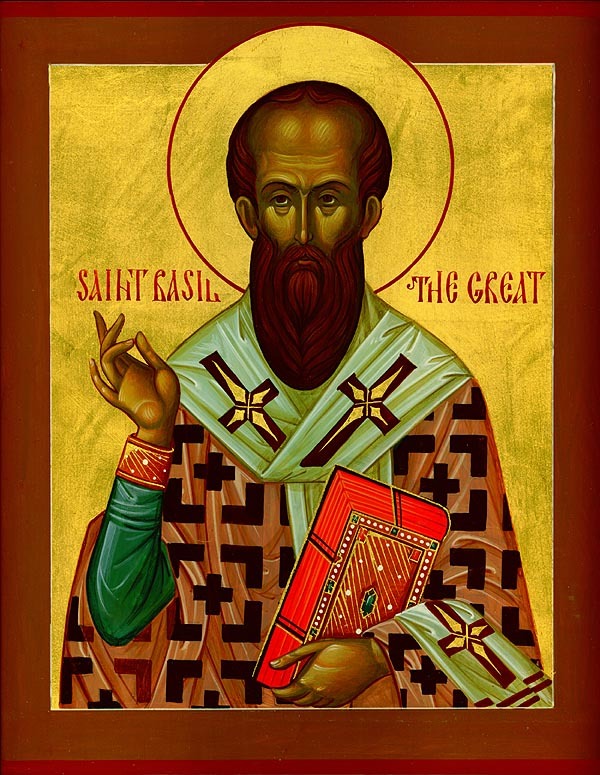 In the first instance there were the Apostles and the Seventy and the women who followed and ministered unto Jesus; then there were the deacons and men like St. Luke and St. Barnabas, and women such as Dorcas and Phoebe, who worked with St. Paul. Nevertheless, it was only toward the beginning of the fourth century that Christian monasticism appeared as a definite institution.